I FIRST READ The Olympian when I was a teen with a love of athletics and fiction. 40 years later, reading the novel again this week was as exciting as the day I first discovered an old pan paperback copy in a second hand store for $2. My excitement stemmed from the prospect of finally putting my two passions together – reading a running novel, something until then I hadn’t done. The Pan Book edition for $2. I didn’t know I held arguably the best ever running novel. Little did I know the well-worn cover-creased paperback I held was, and is still, considered the finest running novel ever written. I recall rushing home so I could start reading and when I did, was disappointed to find it hard work; not at all what I’d expected, due to the story of Ike Low told through the eyes of a Cockney teenage runner. And they don’t talk like us, as I discovered in speech and narrative. Glanville’s words didn’t run off the page as I was used to, yet his prose was pitch perfect as I later discovered when re-reading the novel this week, as an adult and someone a lot more worldly. Despite tripping over the words as a teen, unbeknown to me back then, The Olympian became the most influential book I ever read. While the story is an allegory, as a teen all I sought was a simple story of a runner striving to become, then stay, as the best miler in the world. But The Olympian is more than a simple story. Glanville explores the psychology of running through an obsessively driven athlete who trains to push beyond pain, to control it in competition, and use it beyond healthy dedication to unwittingly destroy everything that otherwise matters outside of a single-minded selfish pursuit of immortality. The story of Ike Low is brilliantly told, starting a year after the Melbourne Olympics when as a quarter-miler going nowhere fast, he’s persuaded to train for the mile by Sam Dee. Dee’s an eccentric maverick who’s non-affiliated to any club, therefore coaches and instructs outside of an establishment who despise him. He is, of course, the antagonist, the overbearing coach with a philosophy to match, from which much of the human condition and variations in training methods and approaches are discussed and dissected. Throughout Ike’s successes and failures on and off the track, from becoming Empire Champion in Cardiff then Perth, from his first Olympiad in Rome, through a turbulent international career, never has there been such an authentic insight into the mind of the middle-distance racer, as Ike hurtles himself headfirst towards a Soprano’s-like climax at the Tokyo Olympics in 1964. 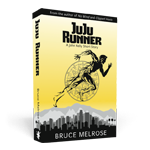 When The Olympian was published, it was bestowed with lavish praise as the best running novel ever written. For me it was more than that. It was my influence for wanting to write my own running novel, as after I first stumbled through reading The Olympian, as an athlete, I wanted more. 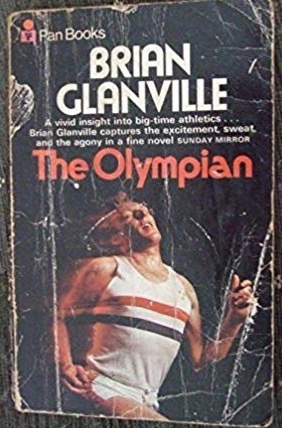 In 2014, 25 years after the first and only time I read The Olympian, I was inspired to write my own running novel, although I deliberately avoided delving into the human condition and philosophies so instrumental in understanding the mentality and psychology of Ike Low, which Glanville so thoroughly explored. In that aspect of the running novel, is there anything more to be said that Glanville hasn’t? I consciously wanted to focus on other aspects instead, more action for one, but also contemporary issues facing the sport, rather than battling through the pain barrier, catching a second wind, the locomotion of the runner, the merits of one method of training over another or needing to understand the motivational why’s that drive an elite athlete’s single-minded obsessions. This is a novel that will deeply resonate with middle-distance runners. And when you’re done, and need more, launch into the greatest series of running novels starting with No Wind. An appropriately inappropriate 1970’s book cover by todays standards. A warning for today’s easily offended – is to accept The Olympian was written/published in 1968/69 so reflects attitudes of that era. The attitudes towards woman’s sport and woman competitors expressed by Sam Dee and others in today’s world are archaic and unacceptable. References to African athletes as ‘darkies’ will be seen as racist, while the turn of phrase used by Ike to reference woman will be considered sexist and demeaning. And yes, while unacceptable today, 50-years ago no one raised an eyebrow. That’s how far we’ve come.